This is a non-fiction recounting of a fatal trip attempting to cross the U.S.-Mexico border which ends, tragically, in the deaths of 14 Mexican nationals in a huge desert in Southern Arizona. This was a much more balanced read than I had expected. 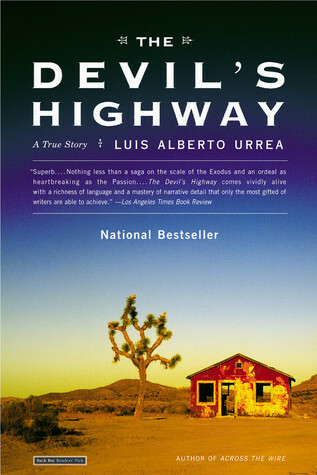 Urrea is a Mexican-American writer and he has immersed himself in other border-experience non-fiction books, and I was anticipating a very pro-immigrant/pro-border freedom type of narrative. However, as the book progresses and you get deeper into the story, you recognize that it’s such a complicated issue with so many moving parts to take into consideration that it would be short-sighted to boil it down into a black-and-white issue. Urrea does not take the easy route here and so this ends up to be a balanced and careful look at the Yuma 14, as the case is called, where 26 Mexican nationals (plus two guides/coyotes) attempt to cross the Devil’s Highway near Tucson, one of the harshest and hottest environments in the world, completely unprepared and led by guides (or “coyotes” as they’re called) who pretty much took their money and run leaving the travelers without food, water or a map. Only 12 men survived the three-day journey. What I really respected about this author was the fact that this is such a hot-button issue and yet he didn’t resort to the easy way of pointing fingers and laying blame. After reading this, I was sympathetic (or at least had a clearer understanding) of all the players involved: the coyotes who bring groups of people to the U.S. illegally; the walkers (border-crossers) who are desperate enough to pay large amounts of money to the coyotes (and their bosses), the men and women of the U.S. Border Patrol (who are mostly just doing their best in a tough situation), and the complexity of the politics on an international level. You also can’t ignore the role played by narco-traffic-ing (which is a whole other issue). Urrea’s non-fiction deserves a larger audience. He’s a great writer covering this huge complicated issue while maintaining his reporter’s neutrality. One good read. This entry was posted in Uncategorized and tagged American, immigrant, investigative journalism, Non-fiction by lizipaulk. Bookmark the permalink.